On Wednesday 17th October I left on a motorbike for an adventure to The Gambia. 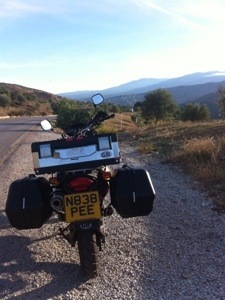 We plan to ride 3,000 miles in five weeks; we caught a ferry to Santander, rode through Spain and are now in Morocco. Ahead of us we have the disputed Western Sahara, Mauritania, Senegal and The Gambia where we fly home from Banjul. Many people have asked why? What makes you want to travel to The Gambia? Why do you want to ride your motorbikes that far? Isn’t it going to be dangerous? And how will you carry all your luggage? The main reason was to leave our London lives behind for 5 weeks and experience new cultures. Being on two wheels allows you to visit places most travelers don’t reach, having no set itinerary will allow us to get immersed in local cultures and completing the whole journey on motorbikes means we have a 180degree view the whole way. It has taken a few months of planning, mainly bike preparation and paper work organisation but now we are in Africa our adventures really start here. The work I do ‘back home’ is all about collecting insights, understanding people and finding ways to help communities. I love being immersed into different cultures and finding out how we can influence behaviours for good. So, another aim of this adventure is to document what we see, who we meet and what we experience. We have a Canon HF10 video camera and where possible intend to film as much as possible. This may, however prove hard at times, especially in Western Sahara and Mauritania where reporters and journalists are forbidden. Luckily though, David is a native French speaker which helps for negotiating…. I’m interested in social innovation and sustainability, especially when focused on communities and making people happy. This is what we’ll be looking out for en route. How do communities survive, especially in developing countries? When we arrived at the Moroccan border at Ceuta there were lots of men trying to ‘stamp our passport’ and ‘help us through customs’. We had been warned of this and knew not to accept their help but they were clearly being very innovative and even had ‘official’ looking name tags around their necks. Morocco came with animals all over the streets, men on scooters piled high with luggage, taxis with broken suspensions and far too many passengers in them and women selling branches on the side of the road. From now on we can start looking for local insights and discover what makes each community different and what cultural differences occur. Two things we quickly learnt in Chefchaouen were that ‘every street has a guardian’ and ‘however little you trust a Moroccan, he will trust a Moroccan half of that’. Let’s hope Abdul really is looking after our motorbikes while we stay in the Medina. Motorbike focused updates are being posted at http://www.twowheelexploring.com and @twowheelexp on twitter if you want to follow our journey, otherwise we plan to have a film edited together in the new year. 1. Heading south to The Gambia means things become cheaper, the weather gets better and the cultures become more interesting. 2. We wanted to ride our bikes to Cape Town but political situations are insecure in parts at thr moment and it would take much longer to plan/save up for. 3. We don’t plan to travel any where ‘dangerous’. We are looking for an adventure but will move on if we feel unsafe. 4. We have three panniers each to carry our luggage. The saying ‘over packed is under prepared’ is very true and we have packed what we need without going over the top. Yes, we will need to wash our underwear frequently…!